Mockups are one of the best tools that a designer can have. They save time and allow you to display your products in a very professional way. Today I’m going to show you exactly how to use mockups to promote products. A while back, I showed you how to use a premade mockup to display your product. Today, I’ll be showing you how to create a custom scene to display your product. 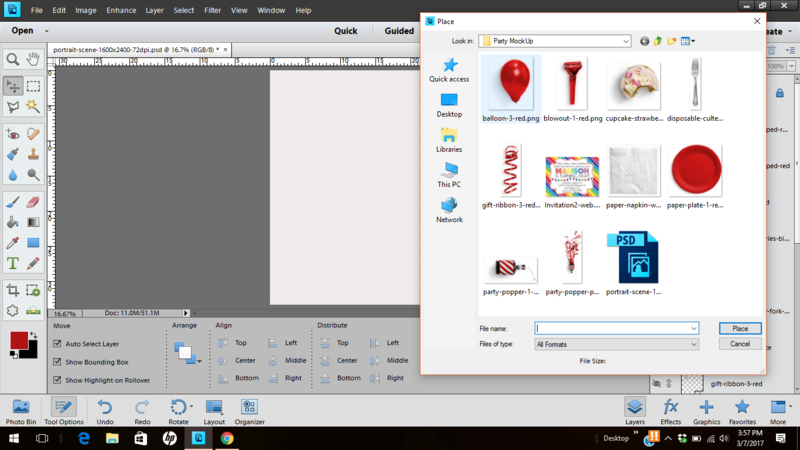 I will be using a printable in my mockup because that’s the product that I sell. Your product may be different but the concept of creating a mockup to promote your product is the same, no matter what type of product it is. 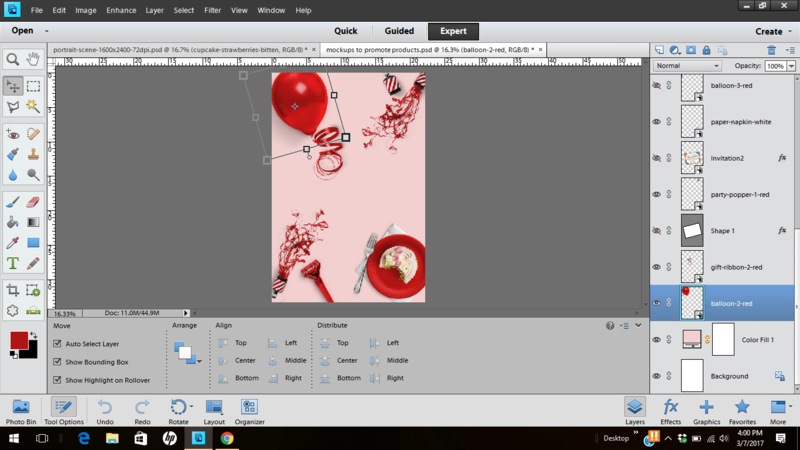 I will be using Photoshop Elements for this tutorial. You can also use Photoshop. 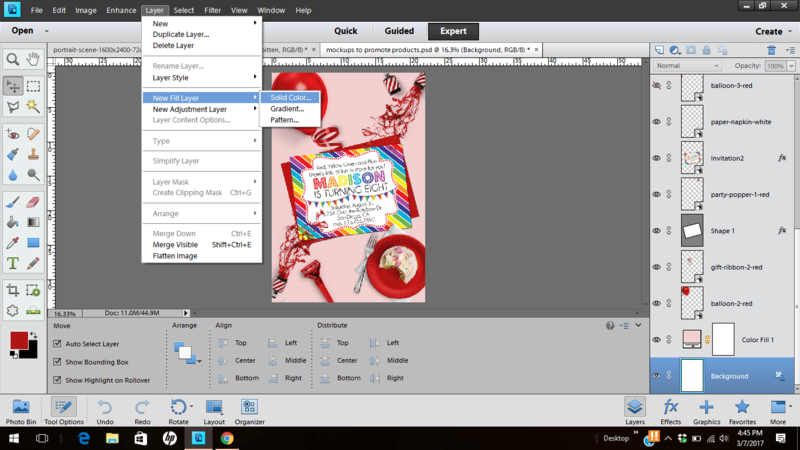 First, you’ll need access to a high quality mockup or scene creator. 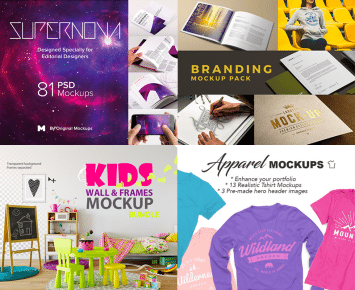 Design Cuts currently has a Mockup Bundle for a ridiculously low price. To say that I was ecstatic when I saw this bundle is an understatement. You’ll want to jump on this deal soon though because it ends on March 13. This is just a sample of what is offered in the bundle. Click here to see the entire bundle. 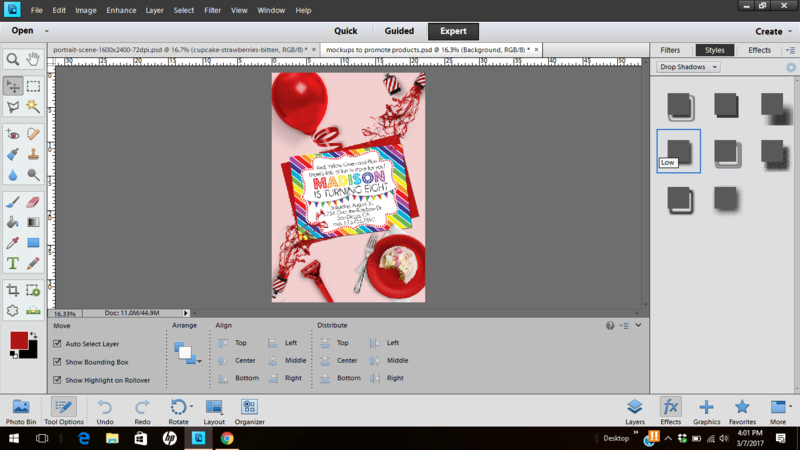 I’ll be using the party themed mockup bundle. Next, open the individual items in the bundle that you want to use for your scene. FILE > PLACE and navigate to the specific elements. You can only select one element at a time. Move and resize each item to fit your scene. 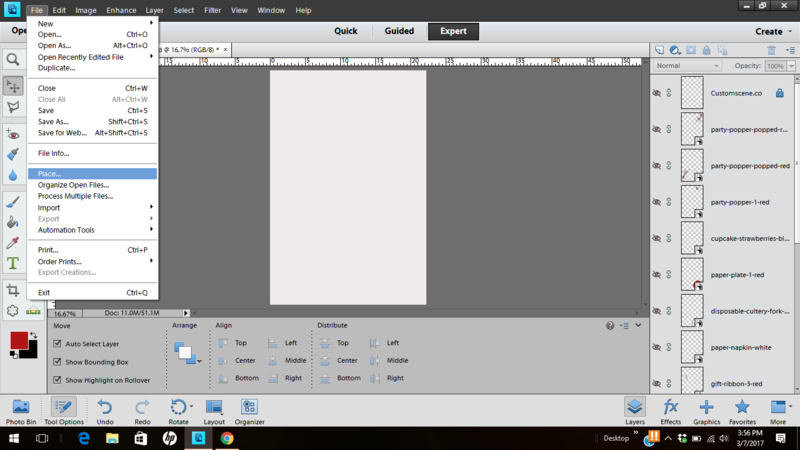 Resize by clicking on the element and then click the corner handles to adjust. Use the MOVE tool to drag your object where you want it. 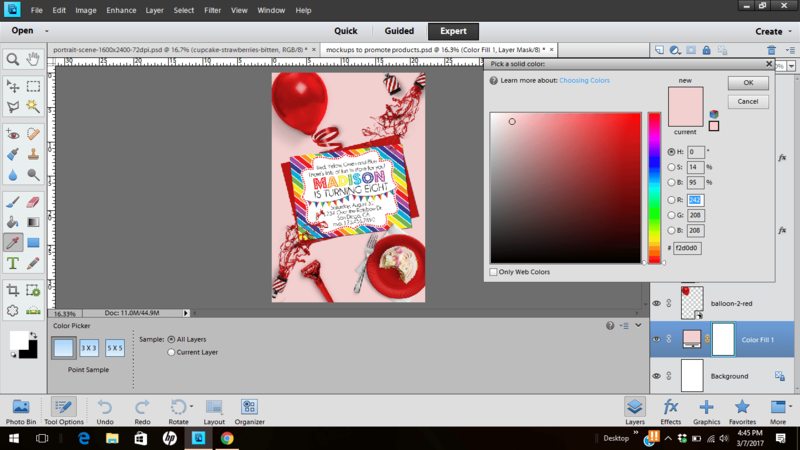 To change the color of the background, add a new fill layer by clicking LAYER > NEW FILL LAYER > SOLID COLOR. And then choose a color. Finally, place your item that you want to display. 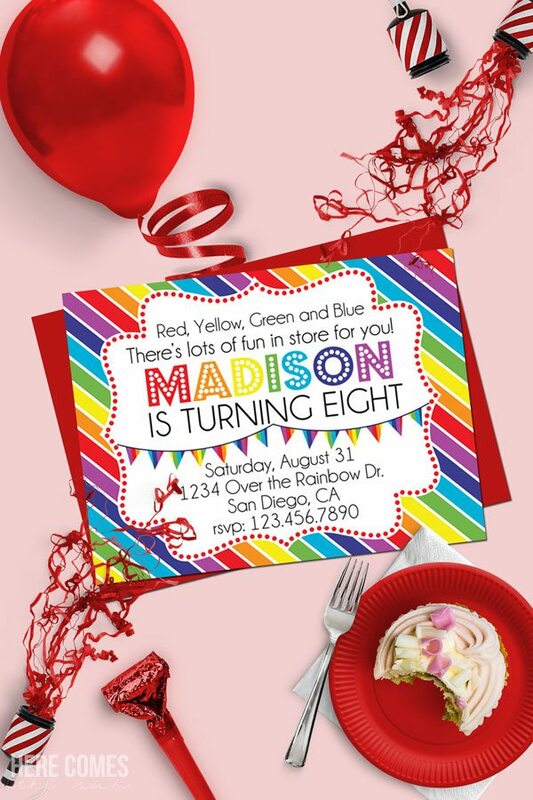 In this case, I’ll use a printable invitation that I’ve already created. You can find the invitation in my shop. Position your item just like you did the other elements of the scene. Add a drop shadow to give it dimension by selecting the layer and clicking on effects to bring up the drop shadow menu. Double click on the drop shadow that you want to use. Save it as a PSD and a JPEG and you have just created an amazing marketing tool for your product. When you use mockups to promote products, you save so much time and frustration because you don’t have to take the photos yourself. Everything is already photographed for you and all you have to do is create your scene. Wow, you make this look so easy that I may just be able to do it too! This is genius! 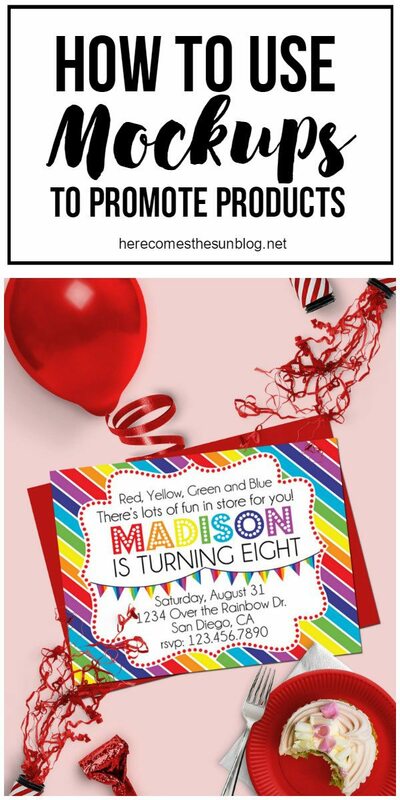 I’m getting into products this year so this is helpful!